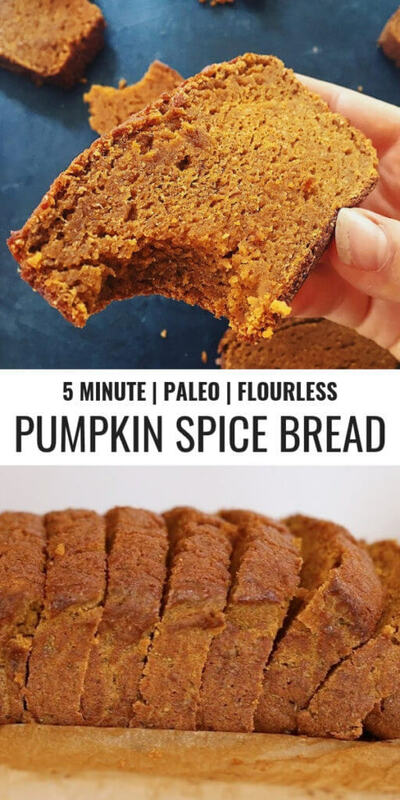 Craving pumpkin bread? 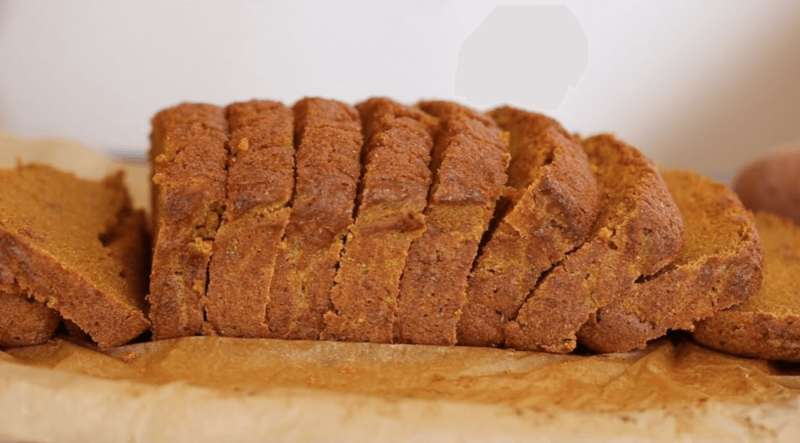 Well, I have something better for you to try… This sweet potato bread tastes like pumpkin pie and is made without flour! 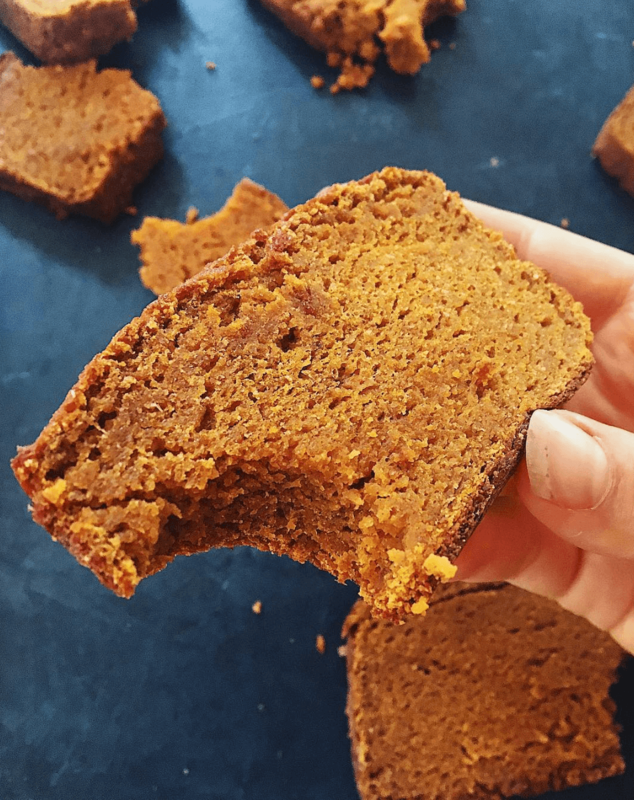 An easy paleo, gluten free, and healthy pumpkin spice bread for the holidays. I decided to take a low-key approach to today’s post and share a recipe I recorded earlier in my kitchen as I was experimenting. It’s really relaxed and nothing fancy, but really delicious! So, join me in my kitchen, as I make this fantastic easy bread seasoned with all the autumn flavaaaaa! This is how I made bread using sweet potatoes instead of flour. Also, totally a newbie at the whole video thing, so just hang in there. Trying something new, because: why not?! This sweet potato bread is like thanksgiving in a loaf pan; you’re welcome. Holiday feels, here we come!! Tastes like pumpkin pie, but BREAD. Also, happens to be gluten free, dairy free, and refined sugar free- so you can eat this for breakfast! I’ve really been on the: just-feed-me-real-good-food-that’s-easy-to-make-train lately and this one definitely fits into that category! Really glad when I can just open the freezer door and pull out a slice of this after lunch for a little something sweet-and-autumn to hit my cravings. I just sliced the bread, let it cool, then layered everything into a plastic storage bag and tossed it in the freezer for later. Meal prep can be pretty great sometimes! Also, whipped cream would be especially heavenly with a slice of this, because truly- it tastes like pumpkin pie. Whipped cream and pumpkin bread totally NOT against the rules at all! GO FOR IT. All out. It will be delicious. Craving pumpkin bread? Well, I have something better for you to try... This sweet potato bread is like thanksgiving in a loaf pan, you're welcome. Holiday feels, here we come!! This is how I tried to make bread using sweet potatoes instead of flour. Tastes like pumpkin pie, but BREAD. Also happens to be gluten free, dairy free, and refined sugar free- so you can eat this for breakfast! Mince 1 large sweet potato or 2 small ones in a food processor until rice consistency. Add rest of ingredients to food processor and blend until smooth. Bake in a parchment lined standard bread pan (4 1/2" by 8 1/2") for about 90 minutes until a toothpick when inserted comes out clean. Kaylie is a 21 year old recipe developer, food stylist, and photographer based out of the Pacific Northwest. 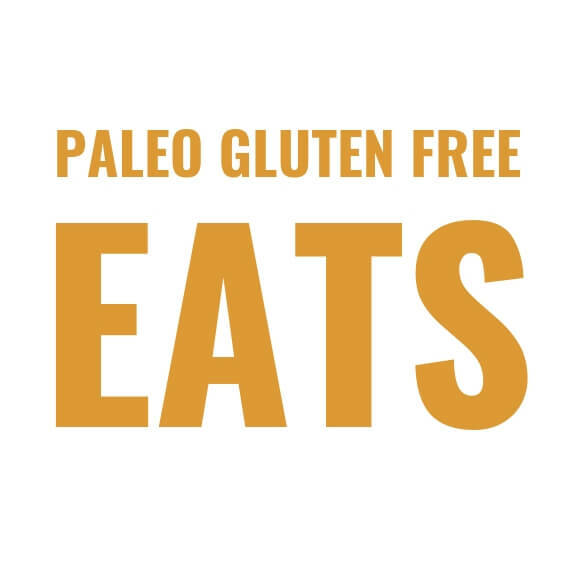 Kaylie founded Paleo Gluten Free Eats in order to bring health and joy through nourishing food and easy recipes! I made this bread this weekend. It’s really easy and really delicious. I took your advice and sliced & froze individual portions so I can enjoy them throughout the week. This baked in 75 mins in my oven, so I suggest watching your time and relying on your nose 🙂 Thanks for sharing your creative recipes, Kaylie! Is there an egg sub by any chance? Hi Theresa, I think that an egg sub might make it gummy, I haven’t tried though. This is truly delicious. Thank you so much for these amazing recipes. Life changing for a momma recently diagnosed with Celiac Disease. Just wondered if I missed a recipe for apple pie -type bread like this? I purchased your bread recipes and am THRILLED! This looks great and we just so happen to have an overload of sweet potatoes going on right now! 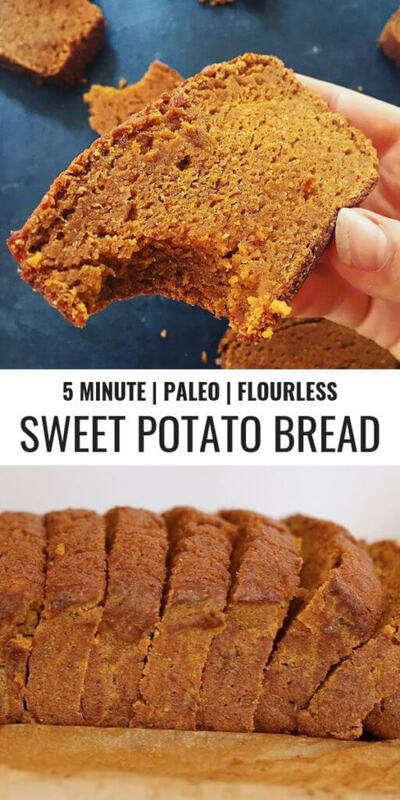 Quick question – is the sweet potato in the recipe raw or cooked? The sweet potato goes in raw then is baked with the rest of the ingredients. I will admit I had doubts about this recipe—it seems like a lot of sweet potato and not a lot of much else. I used extra large eggs and accidentally wasted one, but since they were bigger than the recipe called for, I crossed my fingers. While all the ingredients were mixing in the food processor, I did add a little water because of the lack of one egg. it baked for exactly 90 minutes and it turned out amazing! I can’t believe how easy and delicious this is. Thank you! Thank you Elizabeth! Glad to hear you enjoyed it! Are the nutrition numbers posted per slice or for the loaf? Can it be done in a blender? I don’t have a food processor. Hi Sarah, it may work in a high speed blender like a vitamix. I baked it tonight, I loved it. I had a cook poatato from a meal prep the previous night. I was a little nervous. It turned out perfect. Thank you so much. What is the size, brand and model of your food processor? I have never owned one and would like one that would do this recipe like yours did. I Made in and it tastes delicious but it is very “wet”even if I baked it for 90 minutes: any suggestion? Do you peel the potato? Hi Erika, I don’t peel the potatoes.